In this book children will learn that God is different to us. He is great and he can do great things that I can't do. He made me. He made my family and my friends. He made everything. God's love is also great because he sent Jesus. The first three or four years of a child's life are a wonderful time. Children are discovering so much about themselves and about their world. It is a delight—and often lots of fun—to watch the changes taking place in front of our eyes. Books for Little Ones is a series of simple books written specifically for this age group (1-4 year olds). Along with beautiful photos, each book provides age-appropriate teaching about God and us, in a way that encourages your child to take the first steps of faith—first steps on what will be, God willing, a lifetime journey of growing in the knowledge and love of God. 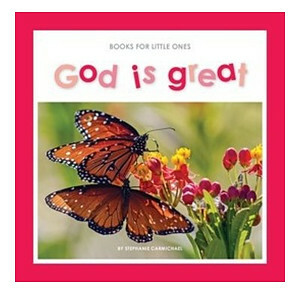 God Is Great by Carmichael Stephanie was published by Matthias Media in November 2016 and is our 24363rd best seller. The ISBN for God Is Great is 9781925424065. Be the first to review God Is Great! Got a question? No problem! Just click here to ask us about God Is Great.